The curriculum is based on SEPUP’s issue-oriented and inquiry-based approaches to science teaching and learning. 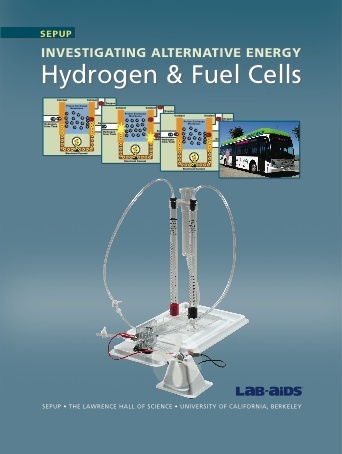 In a sequence of six classroom activities, students are introduced to hydrogen and fuel cells in the context of energy for transportation. This sequence addresses National Science Education Standards and state science standards related to topics such as energy transformations, energy efficiency, chemical reactions, oxidation-reduction, stoichiometry, and societal perspectives on energy issues. A PowerPoint presentation and a short video introduce this module's focus on the development of hydrogen and fuel cell technology as one potential solution to energy concerns. Students analyze tabulated data to investigate several potential options for powering vehicles. Students are introduced to various fuels and consider some of the trade-offs of using them. Students decompose water into hydrogen and oxygen. They solve problems related to the stoichiometry of the reaction. Students use electricity generated by the fuel cell to run an electrical motor that turns a propeller. They measure the fuel cell's voltage, observe the consumption of gases by the fuel cell, and measure the electrical current produced by the fuel cell. In order to understand the chemistry of fuel cells, students are introduced to oxidation-reduction (redox) reactions and half-reactions as a means of creating electric current. They then work with a computer simulation of a proton exchange membrane (PEM) fuel cell to investigate the chemical reactions that occur with a fuel cell. To deepen their understanding, they also manipulate models of oxygen and hydrogen molecules on a schematic diagram of a PEM fuel cell. Students measure the efficiency of a fuel cell. To do this, they measure the amount of gases consumed by the fuel cell and the electrical energy consumed by the propeller fan. Then, they use the change in the amount of hydrogen of the reaction to compute the efficiency of the fuel cell in converting the energy in hydrogen to electricity. In addition, teachers can demonstrate a second method of measuring efficiency: lifting a 0.1 kilogram weight 1 meter with a fuel-cell powered electric motor and comparing that to the hydrogen consumed and the associated change in the amount of hydrogen of the reaction. Students analyze information about hydrogen and fuel cells. They use fact sheets and do additional research to identify the advantages of and the challenges facing fuel cell powered buses. In a simulated City Council Meeting, students consider the various issues relating to hydrogen fuel and fuel cells, and discuss the trade-offs involved in their use.